I woke up this morning craving oat milk. I know, that’s a specific craving, but I’ve been under the weather all week, and so I’m listening to my body. So off to the blender I went, figuring that at the very least I’d get something delicious and nutritious out of this random craving. My usual non-dairy “milk” of choice is my Instant Almond Milk, because it’s so quick and easy and doesn’t have any scary ingredients. Lately, I’ve been making it with cashew butter (so I guess I’m making Instant Cashew Milk), and it has been extra-creamy and wonderful. But sometimes you need a nut-free option, and apparently I was craving oat milk… so I gave it a shot. In order for the oat milk to be gluten-free, you need to use oats that are certified gluten-free. Oats themselves are naturally gluten-free, but as they are usually processed in the same facilities that process wheat they are easily cross-contaminated. I use the Gluten-Free Rolled Oats from Bob’s Red Mill for everything from oat milk, to morning oatmeal, to oatmeal cookies, to veggie loaves. Unlike when you make most nut milks, you don’t have to soak the oats overnight — they just need a quick 10-15 minute soak and you’re ready to go! Once you’ve made oat milk, you’re going to have leftover “oat pulp” — the bits of left-behind oats that get strained away from the milk. The pulp still has nutritional value, and can be quite tasty, so don’t get rid of it! You can use the oat pulp the same way you’d use nut pulp leftover from nut milks… add it to your oatmeal or smoothies, in crackers, or in cookies. I’ve got mine sitting in my fridge for a batch of cookies I’m going to try this weekend! I find that if I’m drinking them straight up, I love all of my vegan “milks” served super-cold, straight from the fridge. But usually, I’m more likely to pour a splash over oatmeal, make myself a decaf latte, or add it to a recipe. Whichever you choose, the oat milk will keep in the fridge for about 3 days — give it a good shake or stir before you use it, as it will separate. 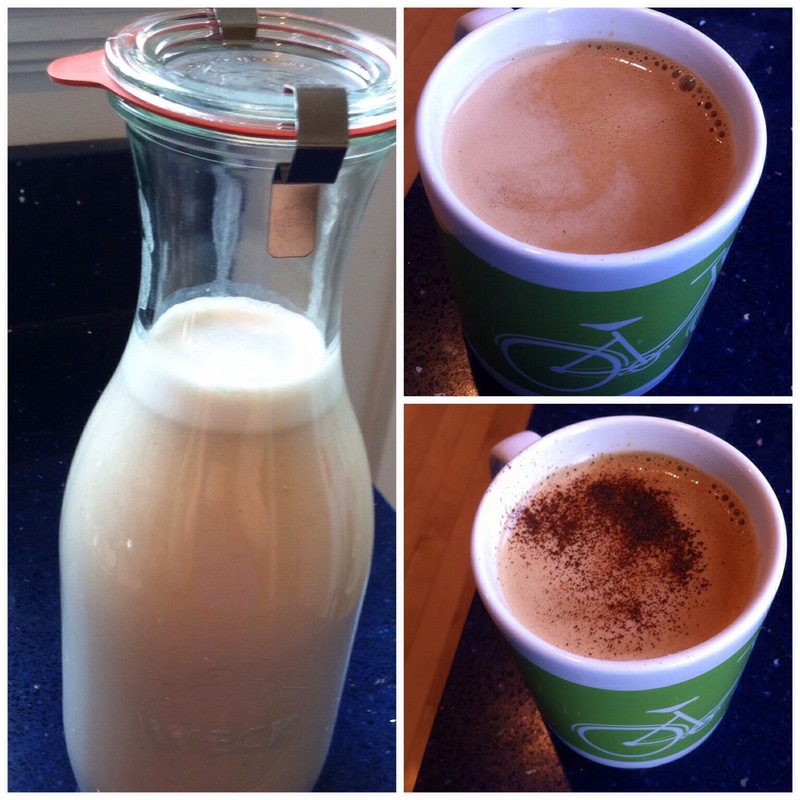 This morning, it was latte time with my fresh oat milk. Ohhh yes, just what I needed. Begin by soaking the oats: pour your oats into a large bowl, and cover with water. Let sit for 15 minutes. Then drain the oats as well as you can, and add them into the blender along with the 3 cups of water. Blitz on high speed until smooth. Strain with a fine sieve to separate the excess “oat pulp” from the oat milk. 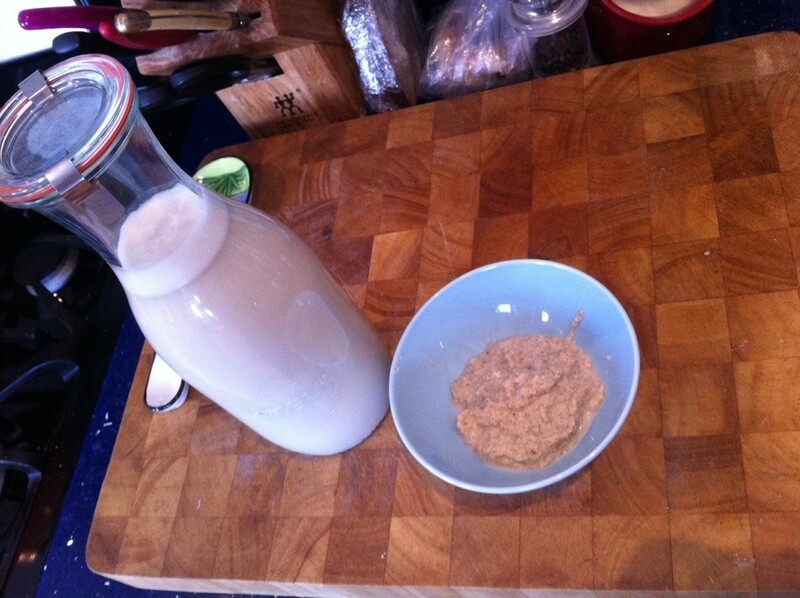 Set the oat pulp aside and pour the oat milk back into the blender. Blitz again on high speed, and strain one more time. 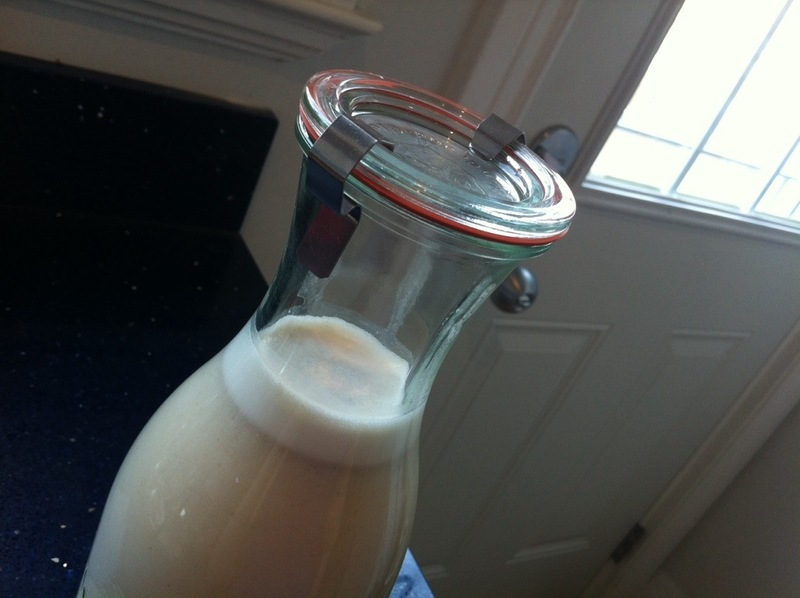 Pour the oat milk into a container and store in the fridge. Even easier than nut milk!